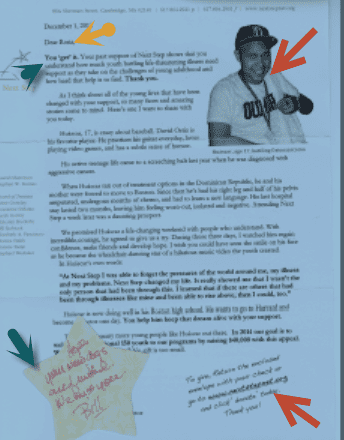 Fundraising Tuesday: The Ideal Appeal Letter - Communicate! I’m republishing one of the most popular blog posts ever on this site. Read to the end for the 2017 update! November kicks off the annual scramble for donations in the U.S. Your mailbox fills up with appeal letters from groups you support (and some you don’t). But do any of them look like this? Next Step filled their letter to my wife Rona with signs they care about her. Creating visual appeal. The photo catches the eye. Using a real story. It’s not just a photo: it’s a person, looking you in the eye, telling his story. Adding a hand-written note. It’s actually on an orange sticky note, and the content is personalized to Rona. Directing her clearly how to give. Next Step understands that donors will give if they feel that their donation is doing the good work. As Seth Godin recently wrote, the donor is the hero of the story. That’s why they give. Now, your letter doesn’t literally have to start with “You.” It would be boring if every letter did! But when you wrote your organization’s annual appeal letter, did you start with the donor? Did you do everything you could do to make them feel the letter was personally written for them? And did you place the donor at the center of the story? Don’t you do this! The nonprofits who are sending out the ideal appeal letters are stealing your donors. It’s time for you to win them back.